0126978178 BU 4200sf LA 20387sf Country Heights Bungalow House Kajang for Sale for Rent pid=1324. 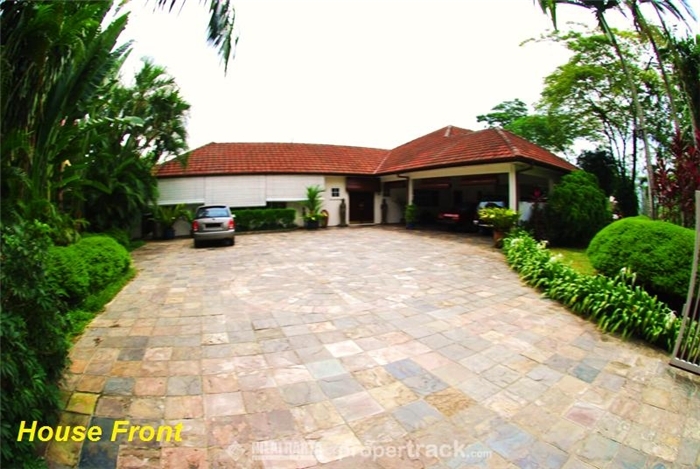 For Country Heights Bungalow House Homes Property Properties Kajang Selangor for Sale Rent Rental Rentals Lease and to Buy Sell Sales enquiries, telephone the Property Desk on (+60) 03.2032.3168 / Duty Handphone (+60) 012.697.8178 or simply click on the blue propertrack Malaysia Nilai Harta Consultant Sdn Bhd Contact Agent link below. The detached Country Heights Bungalow House is offered with 4 exquisitely furnished bedrooms, a study room, 4 bath rooms, a powder room, a great room (ie. 3 living rooms), open gourmet kitchen, separate maid’s quarters (room + bath + kitchen + own washing machine), a swimming pool, a sauna room, a large garden together with a covered and spacious car porch complimenting the well-landscaped environment coupled with complete privacy. The Country Heights Bungalow House was built in 1992 and has been regularly well maintained and upgraded to include central and split air conditioning, central vacuum, CCTV perimeter surveillance, alarm system, auto gate, walled & fenced as well as extra water tanks. New water plumbing and sewage systems has been installed to include new drains from kitchen to back of house, septic system, new pipes from pool pump area, upgraded solar water heating system (with 2 new booster heaters), new main water pump, new auxiliary pump and water filter (new polymer filter bed) as well as new wiring and electric systems. Structure improvements and replacements of new roof gutters all round, new roof insulation, new outside rustic wooden blinds to cover all windows, new roof on pool cabana, 1000 sq ft of new slates drive and pool deck and interior fencing for dog patrol safety. The Country Heights Bungalow House requires little air-conditioning due to surrounding trees, blinds and open night alarmed windows. Country Heights is the first gated community in Malaysia, was developed by well-known Property Giant, Country Heights Holdings Berhad. The luxury development covers a vast land area surrounded by luscious greenery and lakes. It is a harmonic residential area which comprises of a limited number of freehold bungalow lots all being safely guarded by a 24-hour security system. The neighbourhood is situated near to the PutraJaya Diplomatic Enclave, Precinct 14 and offers accessibility to hypermarkets, major highways and interchanges, KTM stations, schools and hospitals. Country Heights is a highly sought after housing area due to its accessible location and exclusive low density living environment. It is only 25km away from the Central Business District of Kuala Lumpur (CBD), Sri Hartamas and Damansara not to mention a valuable long term investment as Putrajaya, the administrative capital of Malaysia, is a mere fifteen minutes away.